If there's one kind of food I can eat everyday, it would undoubtedly be sushi! From all the cuisines I've tried so far, it's the Japanese fare, most especially sushi and sashimi, that I hold dear in my heart and palate. And I can still vividly remember the first time I got to eat sushi. It was at a small eatery near my elementary school. Though the sushi was so simple -- tuna, cucumber and mango wrapped in rice and nori, it was one dear memory I will forever remember. 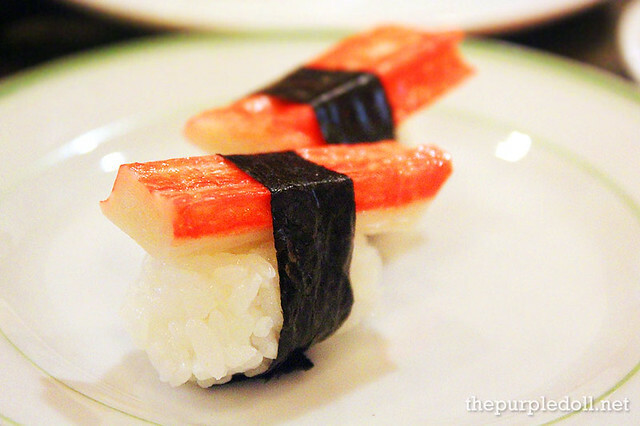 The day I fell in love with sushi, and vowed to eat more of it. If you've been a reader for quite a while, you've probably noticed how I always gorge on sushi after sushi and sashimi after sashimi whenever I'm at buffets that carry my most favorite food on the planet. However, there are times that I'm just fixated on the sushi and sashimi, so dining at an eat-all-you-can restaurant with a very wide spread and a really high price might not seem like a good and sulit option. Good thing I've recently came across a restaurant that offers just what I want and need. Unlimited sushi and sashimi. 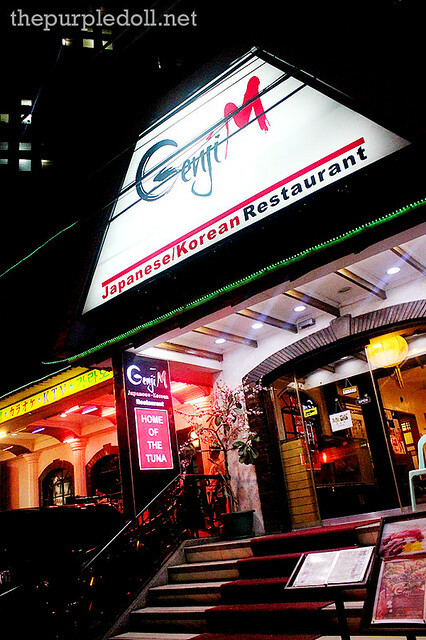 Located at Kalayaan corner Makati Avenue, Genji M is an Asian fusion restaurant that specializes in Japanese and Korean fare. 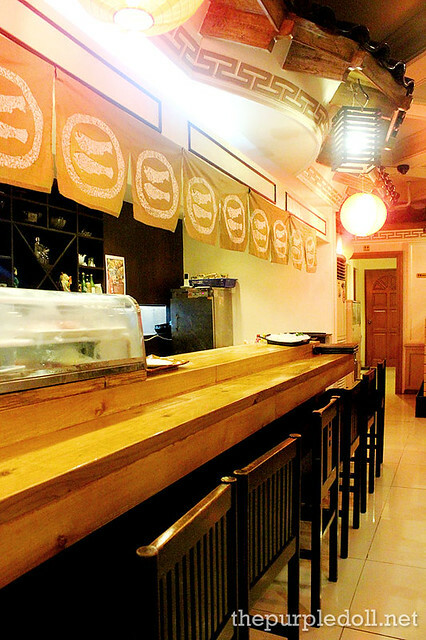 When it first opened in October 2013, the restaurant has intended to target Japanese and Koreans in the city. However, with its recent menu revamp, it now aims to also get the attention of the local market. And with its newest offering of eat-all-you-can sushi and sashimi, they really got it going for me! The Unlimited Sashimi, Sushi and Rolls at Genji M isn't one size fits all, which I really like 'cause there's something for every type of sushi lover. 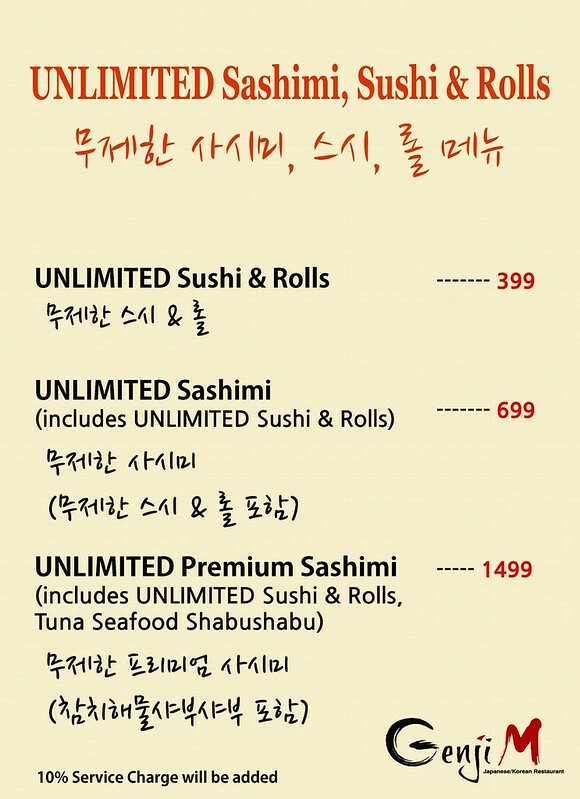 For those who don't mind skipping the sashimi, you can just get the Unlimited Sushi and Rolls for a pocket-friendly price. For people like me who are crazy over sashimi more than the sushi, we can go for the Unlimited Sashimi which already includes eat-all-you-can sushi and rolls. But for the discerning palates who crave for unagi, uni, and tuna belly, they can shell out more (still less compared to ordering a la carte) and enjoy the premium items on top of the regular selection. 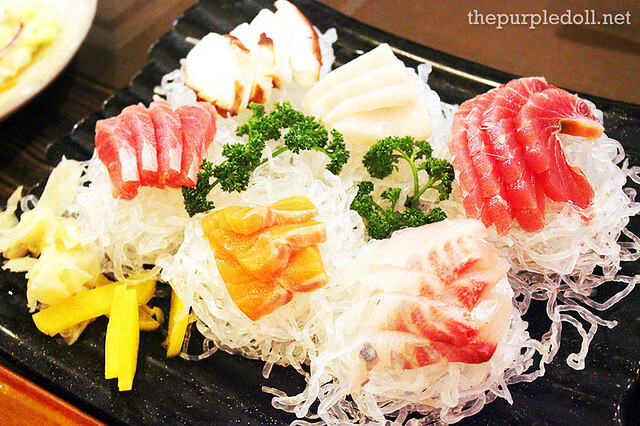 You can even enjoy a tuna seafood shabu-shabu session. For my Genji M visit, I got to enjoy what I really want, eat-all-you-can sashimi and sushi. To start the sushi fest, we first had this plate of nigiri sushi made with salmon, tuna and lapu-lapu. It was my first time to have raw lapu-lapu, and I liked it! It's mild and delicate on the palate, contrary to what I expected it to be. But I didn't just enjoy the lapu-lapu. I like every single one on this platter. 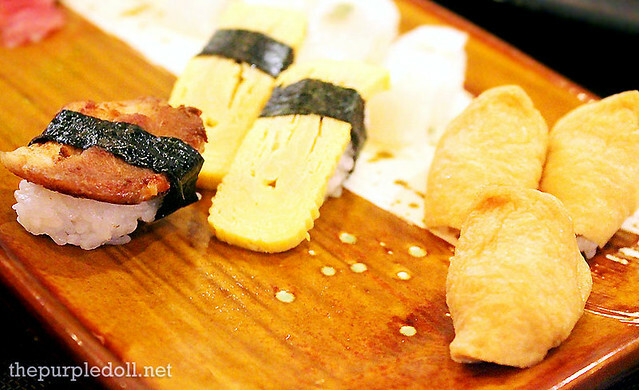 The fish slices were fresh, with wasabi tucked between the fish and the rice. They also used well-seasoned Japanese rice. If I have to nitpick the pieces though, I guess a better ratio of fish to rice would've made the nigiri perfect. I came in a little late, so pardon the half empty plate. On this end of the platter, we had pieces of nigiri sushi made with samgyupsal (pork belly), Japanese omelette, and squid, which all tasted good. Texture-wise though, the samgyupsal can be made better if it were cooked a little less done. As for the Baked Tofu Sushi, it was interesting to see a different presentation to the usually-rectangular inarizushi (sushi rice in tofu pockets). Genji M's were pyramid in shape which made it look cuter, and more fun to eat. As a fusion restaurant, Genji M decided to offer a marriage of Japanese and Korean cuisines which gave birth to the Bulgogi Sushi. 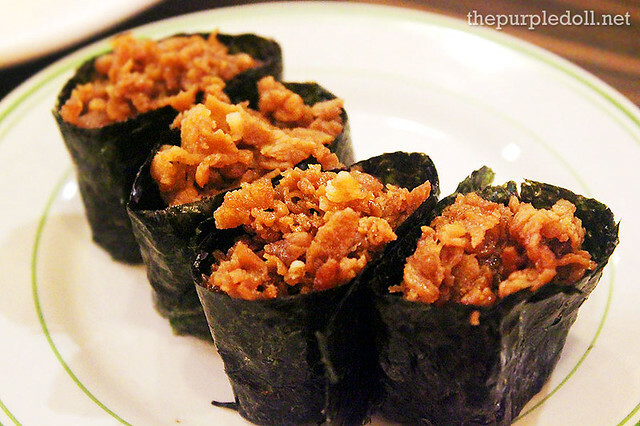 This is an interesting sushi item that oozes with sweet and savory flavors (something the Pinoy palates will sure fall in love with) that blend nicely with the slightly sweet, slightly sour sushi rice. Since I can't get enough of the Salmon Nigiri Sushi, I decided to order more. Just look at that glorious slices! Don't they look beautiful? When you order through the checklist, the sushi and rolls will come in two's. Except of course, if you order the platters. The previous salmon sushi was already a good catch. 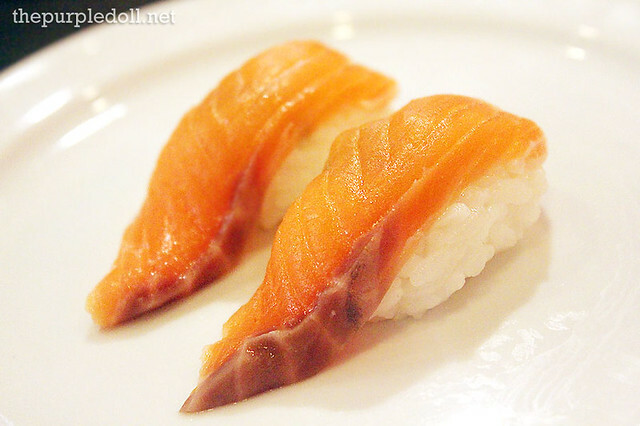 But this Fatty Salmon Nigiri is even better! Not only did they use a fattier portion of the salmon, but they also scorched the top a little to give it a slightly charred flavor. 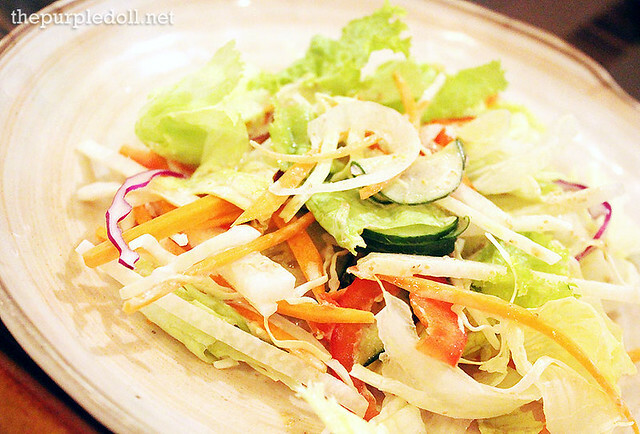 They even topped it with some Japanese mayo and a small onion slice which made every mouthful taste oh-so-divine! 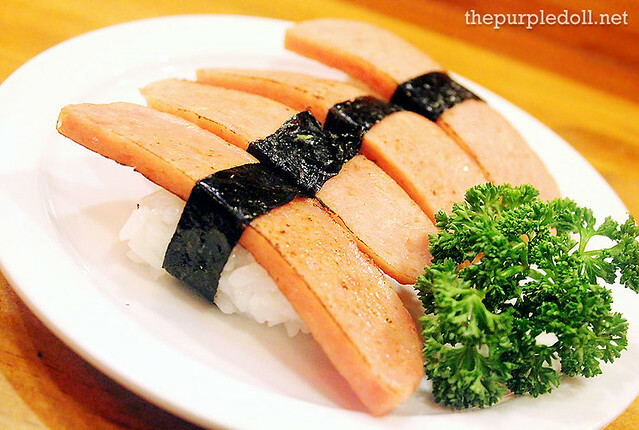 For the kiddos and those easier to please, there's the Kani Sushi and the Spam Nigiri. I didn't care for these 2 that much since I can easily whip them up at home anyway. Then came my most awaited items, the sashimi. We had different kinds and every one tasted fresh. Definitely not the frozen ones you usually get from fast food chains. As expected, I hoarded my favorite salmon and octopus. The tuna, lapu-lapu, and tuna belly were really good too. Usually, I shy away from ika (cuttlefish) sashimi since I get jaw-damaging rubbery ones most of the time. However, at Genji M, the ika sashimi had a really enjoyable texture. Soft, yet slightly chewy with just the right bite. Of course, we had round 2 of the sashimi! But instead of having the cuttlefish again, we had the blue marlin one. And as expected from fresh slices of sashimi, everything tasted great. I can't remember how many slices I had that night. But one thing's for sure, I was the one who had the most number of sashimi on our end of the table! 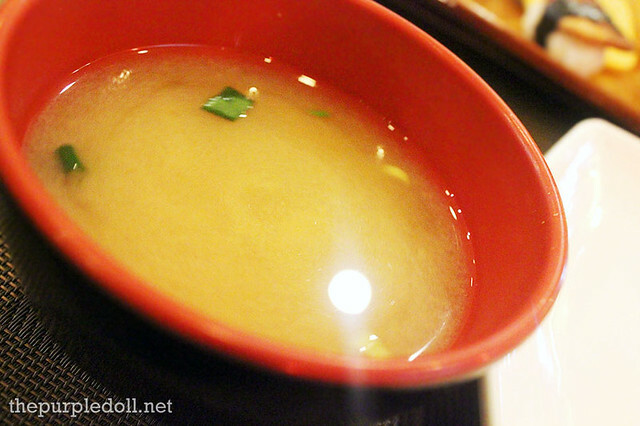 When you avail of any of the 3 Unlimited Sashimi, Sushi and Rolls promo, you also get complimentary miso soup which can still use some improvement, Japanese-style salad which was really good, and kimchi salad which I managed to almost finish off... So good with sushi! By the way, I'm not so sure, but I think these 3 items are also unlimited. Print this coupon and get P250 off! One coupon per person only. Here's a good news, everyone! You can print this coupon to get P250 off your bill! If you're dining out with say, 4 more people, you can print this out 5 times, and get a P1,250 discount! Or, if you'd like to avail of Genji M's Lunch Specials which only cost P250, you get to eat for free and just pay the service charge! Sounds tempting eh? I-print na yan! For a sushi and sashimi lover like me, this visit to Genji M is like a trip to a cool amusement park for the kids. They may not have the widest variety when it comes to the rolls, but the freshness of their seafood, and the good selection of sushi and sashimi, more than makes up for it. 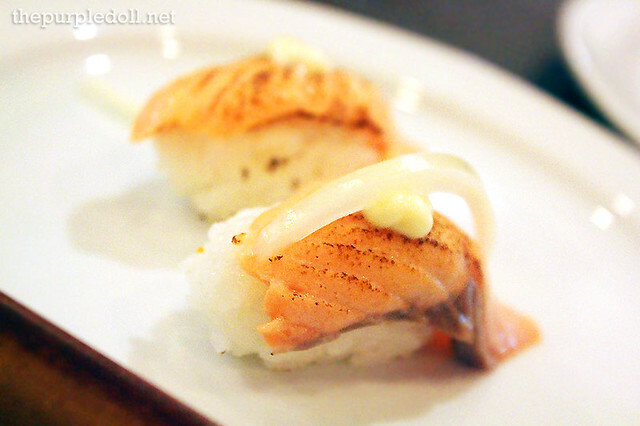 Genji M will definitely be one of my go-to places should I crave for sushi and sashimi. The P699 price tag is very reasonable compared to ordering a la carte. I might even try the premium selection next, when my unagi and uni cravings kick in! 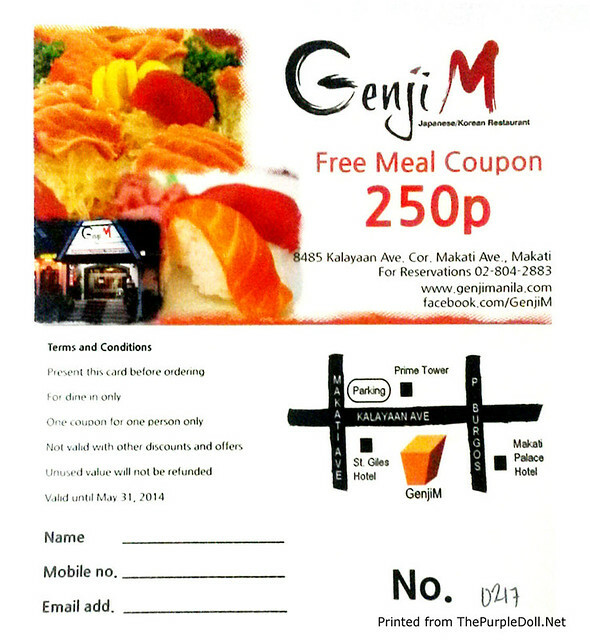 So do I recommend Genji M for your sushi and sashimi fix? Definitely! Hey Carmina, yup you can! :) You can print out as many copies as the number of people in your group when you dine in. Make sure to call for reservations though just to be sure. ^^ Happy sashimi & sushi eating! Holy moley you got a great promo here! We pass by this place everyday going to work. Time for a lunch out :D ! Sorry to hear about your bad experience, Anon! 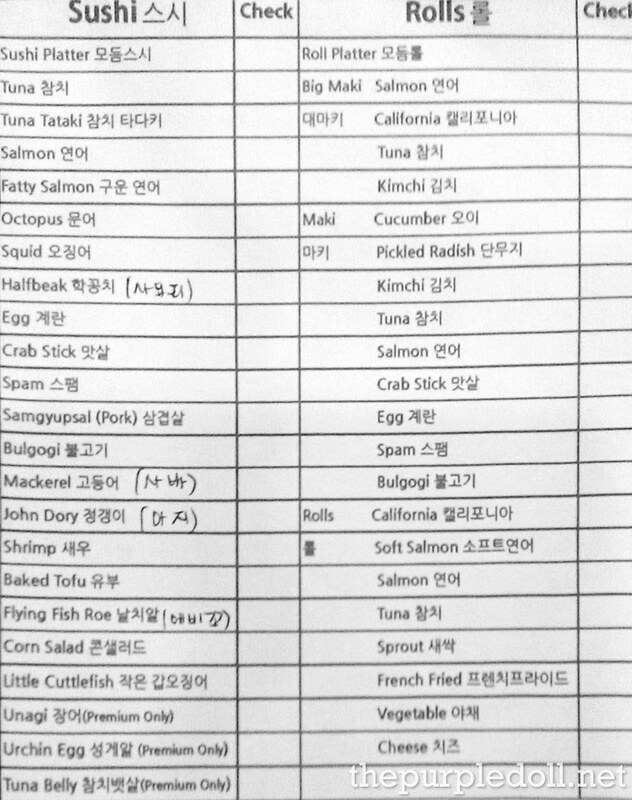 :( I would've just billed out too if they only serve 1 sashimi/sushi variant. It's unfortunate that they can't keep up with the demand. But thank you for sharing your experience! This would help both the resto (for feedback) and the potential customers (as warning?). Anyway, I hope you won't have such a bad dining experience again in the future. Went there yesterday with Mom and bro, was VERY DISSAPOINTED! they couldnt control the crowd,at the end some left, some got irritated and left. she got the name because maybe will report it to some government . She said its her right to ask the girl and chef name. So sorry to hear about your bad experience, Shudosiy. I guess the restaurant really had SERIOUS problems catering to the demand. Anyway, I hope the resto would learn from all these. I think they weren't well-prepared after they promoted their unlimited sashimi and sushi offering. But thank you for sharing your experience here. Like what I said to Anon, your post will definitely be of help both to the resto (I hope they read this), and to potential diners. Maybe the resto can implement a "time slot" system like what Kitsho did when they offered their Japanese buffet. Or maybe put a cap to the number of diners per night so they wouldn't ran out of sashimi/sushi variants. The buffet that we had isn't really a buffet if you put it...( when will you call unli sushi...that is coming in 15 mins. interval from last?) How do you call an unli sushi with limited sushi, and mostly repeated random order? take note I pointed out to the white guy waiter to give us random orders( What i expect= korean sushi, california maki , salmon sushi, tuna sushi, egg roll)...( what RANDOM order means to them= 1 plate of sushi , 1 plate of bacon sushi, 6 spam sushi , 1 plate of imitation crab, follow up order extra fatty bacon sushi again..) You call this random? So far Their real problem is the expectations of people going to eat all you can restos, might be the chef is too imaginative of his sushi store that he forgets people eating in these kind expect all foods lined up for them to munch, right,saying that it is prepared carefully,yes you could do that fast enough but exactly tell me whats holding the 8 pcs sushi up for 15 min? 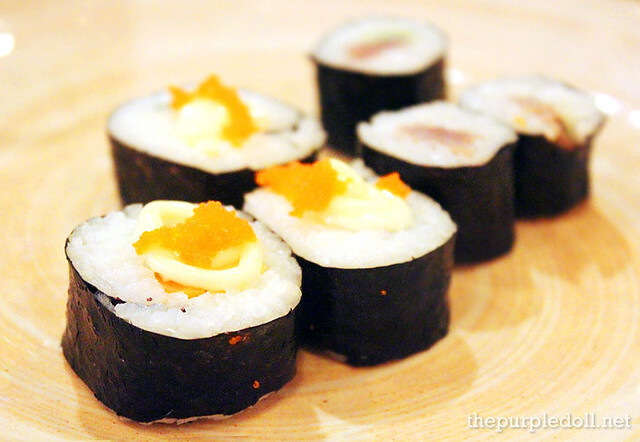 have you eaten a plate of sushi which contains only 8 pcs? If in normal time you must expect that 8 pcs sushi will only last few miutes, why wait for us to buzz and make another order, THE EXPECTATION of people is once ordered this and that , is to LET THE BUFFET eating begin... genji-M really was not any of this. My partner and I had their unlimited sashimi for dinner here yesterday and it was a very nice experience. The guard was kind enough to go out of his way to assist us in parking at the basement. The new manager, JM, was very gracious in showing us to our table and making sure that we had a pleasant dinner. The servers were always smiling and were very courteous and accommodating. Our orders were all delicious and were promptly delivered. All in all, it was a very great dinner. BTW we used the coupon you have in this post (one for each of us, so a total of P500 discount) and it worked without a hitch: we just had to fill out the blanks in the form, which you can do even before going to the resto. Some notes: a) if you're going unlimited, all of you at the table have to have THE SAME unlimited meal; b) they compute the 10% service charge based on the NON-DISCOUNTED price; c) on the map drawn on their coupons, you can see there's parking on the opposite side of the street, but when we went to that place it was closed, so don't go there anymore since they have some parking on the front and more parking at the basement. This post really caught my attention. We have the same dilemma, when dining at eat-all-you-can restaurants, I tend to fill myself more with the Japanesa cuisine, most especially sashimi. Great feature. Will try this out soon. Wow, lots of comments, hope they'll fix the problem before I get to dine there too:)just saying:) I'm trying to learn to eat Japanese food kasi, very healthy and I so love soy sauce! I love japanese food! hope to eat someday over at Genji with my wife! We ate here last month and the waitress got shocked with our appetite! I love Japanese food. Will try to eat there using the coupon. Hope I won't get disappointed! Ang layo lang :( But if it's sashimi, then I'm game! Japanese food is also a fave of mine. 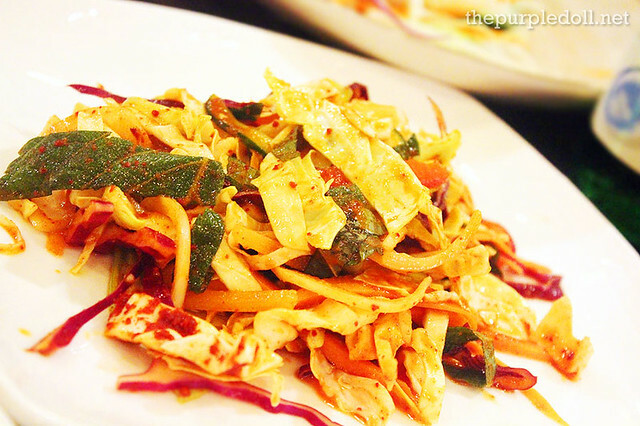 Have you tried Yaku in Podium? I am looking forward to try their unlimited sushi but read quite a number of negative feedbacks, I am happy to hear through their fb page that they are improving their service. Possibly overwhelmed with the clients they got. Will wait for a few months before visiting them. quite far eh but thank you for sharing this post. I have an idea what else to order. I love Japanese foods so much, I tried so many Japanese Restaurants & Japanese Food Section of some hotels but I never tried Genji M: Eat-All-You-Can Sushi and Sashimi in Makati. Hope to try it soon too. i wanna try the sushi..
399 is so sulit! The food looks delicious! 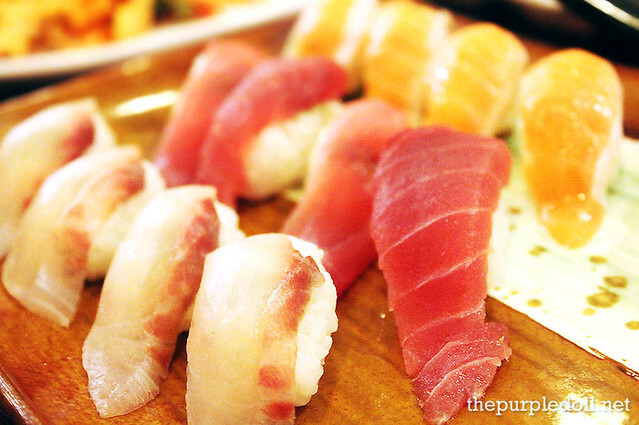 P250 Off on your next Sushi, Rolls or Sashimi buffet! *valid on our Regular Unlimited P499, P799 and P1499 buffets! Check out this article to get a copy of the coupon! For inquiries, call us (except during our break time from 2:30-4:30pm) at 0906 301 91 53!" 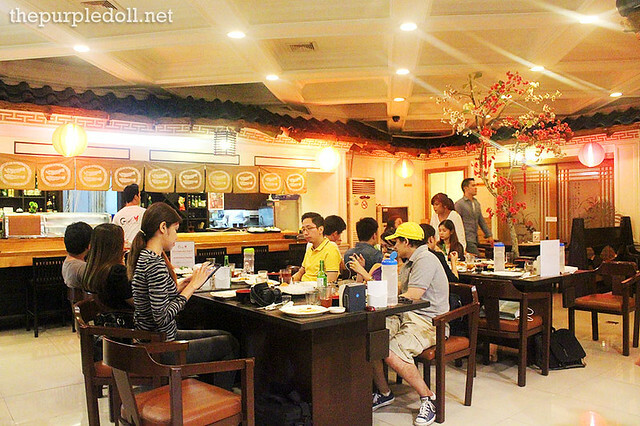 havent tried this restaurant yet, My hubby and I loves korean food we should visit this soon.